Announcing the William Hill Bingo Hall!! Gambling World is Proud to Present William Hill Bingo! 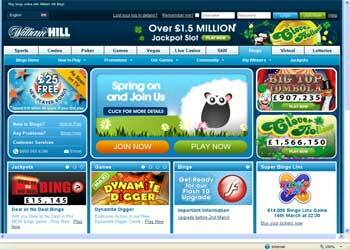 Having a rather long history and experience in gambling, William Hill is a well known name in the Gambling Industry. In fact they were founded in 1934 and operate approximately 2300 betting shops in the UK and Ireland. It made logical sense to open an online website for their sports betting and casino clients, so they established William Hill Online in 2008.Since then they are fast becoming one of the leading European online gambling and sports betting businesses. Recently they have opened a Bingo Room. William Hill chose the Playtech software platform for their bingo because many bingo players that have played the various bingo software providers prefer Playtech the most. This is probably due to the many features offered and ease of use for both the beginning bingo player as well as those players who visit the online bingo halls on a daily basis. The loyalty program automatically pays instant cash bonuses for every real dollar you play. The software easily allows you to track your real account and bonus account in real time so there is never any question of your financial account. Customer service is there for you any time you might need it. They are happy to answer any questions or help you deal with issues at a moments notice. You never have to worry about getting paid your winnings. With such an excellent reputation in the gambling world it only makes good sense to play bingo at William Hill. New account holders get a £25 New Player Bonus. All you need do is spend £10 on any bingo tickets or strips during the first 48 hours as a new account holder and you qualify for your free £25 bonus. This certainly gives new players the opportunity to learn how the software works and see how they like the games.